I know we all have fall on the mind and this is definitely a bit of a summer post, but I took these photos months ago and have just now gotten around to posting them! I wanted to share my Dads homemade pickle recipe with you all because it is just so good ! He picks all his cucumbers from the garden so they are home grown, organic and delicious! Boil salt, water, sugar, and vinegar in a pot for 7 minutes. Remove from heat and add pickling spice (wrapped in cheesecloth bundle). 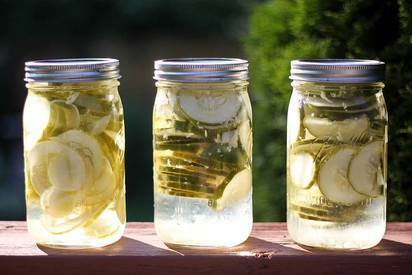 Fill a mason jar with sliced cucumbers and pressed garlic, then pour slightly cooled pickling water to the top of the jar. Seal and refrigerate for up to a week before eating.